When I mentioned I was thinking about doing a post on board work, I got a flurry of comments from a couple of department chairs who frequently observe teachers. Make a plan for the board before class. Write the date, your goals and the homework assignments at the beginning of class. Use the board, but don’t talk to the board. Don’t erase immediately after you write. Write big enough so everyone can see. Use color-coding to show different parts of the grammar. Think about the shorter students who can’t reach past the middle of the board! focus class attention on one bit of language or task, so that everyone is attending to the same thing. situate a lesson in students’ zone of ability by putting student generated language on the board and then clarifying and extending it. provide a means for making observations about patterns and ideas, so that students can discover meaning. The following high-beginner to intermediate lesson fragments show how these principles might work in the classroom. To get a sense of what the students know and do not yet know, try eliciting target vocabulary through game-like activities such as miming–think Charades; pictures—think Pictionary; or giving a definition or example to try to get the word from students without saying it—think Taboo. For example, if you want to elicit the word dangerous. you might say, “There is a big dog, and it is chasing me. The dog is _____.” Or “I am walking, and I do not see the car. It is not safe in the street, so if it is not safe, what is it?” Chances are someone will say, “dangerous.” You can then write it on the board and begin building a list. If no one can say the word, you will find out. You will have established the meaning, or the “need to know,” and you can say the word. Of course, it is important to bear in mind that not all students will be familiar with dangerous, so the lesson does not stop there. Dangerous can be combined with other words in phrases and provide a foundation for subsequent activities, but the eliciting exercise can go a long way towards giving you a sense of which words need more attention and which, less. 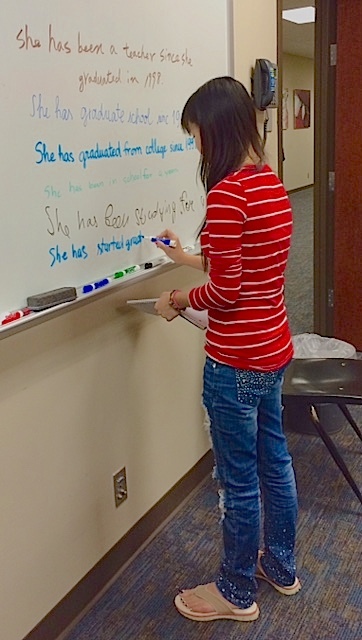 Grammar is a major feature in board work, so here are two examples of interactive grammar lessons. The first is for describing people with comparative adjectives. The target grammar can be elicited in the following sequence. Start by inviting two students to each draw a person on the board however they want to. Have the class name the two characters. (The drawing has the added benefit of fun—the figures are always charming in some way.) Next, elicit adjectives to describe each person to generate a list of familiar adjectives. Once the context is set, and the vocabulary is available, students can focus on the grammar. Invite volunteers to compare the two characters as a means of eliciting comparative adjectives, e.g., Jim is taller than Frank. Frank is more athletic than Jim. After you have examples and dealt with observations and questions, set individuals or pairs to produce additional examples in groups, or elicit several sentences orally as a class and provide feedback on accuracy. The examples can go on the board for a written record, which nowadays usually means students snap photographs with their phones. The next lesson works with the present perfect in describing one’s work and educational history, an important ability for many students. Because the meaning and context are tricky, a delayed error correction stage helps the teacher and students see how students understand the structure, and where there may be gaps. In the first step, generate content by having students list their career history and use the information to write sentences. Note that they will have to choose between present, past and present perfect—as they will in real life. As they write, circulate, make notes, and identify sentences that represent different features and errors involving the present perfect. Note that the following list includes both correct and incorrect examples. I have graduated from high school since 2012. I have worked for that company for fours years until I got married. I got my first job in 2007. I have finished to study for four years. I have been study English for three years. I have finished college in 2007. When the minute is up, elicit answers, writing a ✔ or an X next to correct and incorrect sentences respectively. Invite students to make observations or ask questions as you go, but do not start correcting yet—again, the aim is for the weaker students to have a chance to work the patterns. Finally, have students discuss the corrections with a partner and nominate individuals or ask volunteers to make the corrections on the board. It is often tempting to move quickly, but when possible, consider there may be value letting the class slow down so that students can internalize, discuss their interpretations, or simply copy the sentences at their own pace. The board is also useful for guiding the class through an outline or summary of a reading or listening passage that more closely resembles real college work than many textbook activities. During the first pass with the text, direct students to listen/read for main ideas. For example, tell students individually or in pairs to divide a passage into sections and determine the focus of each section. (Provide the number of sections if you want to add additional scaffolding.) While they discuss their ideas, circulate and provide help as needed. Next, invite individuals/pairs to share their main ideas. Field their answers in a whole class discussion to create logical sections. Write the key ideas across the top of the board in a specific color such as black to create a chain sequence. On the second pass, direct students to listen/read for details for each section, also giving time for them to confer with a partner. As they work, note effective examples, and ask the writer(s) to put them on the board in a different color such as blue or green to denote the difference between main idea and support. Repeat the process as necessary until the task has been completed and the notes are available to students for reflection or subsequent tasks. The board is old school, and many teachers now use projectors to achieve the same goals as well as new ones, but in each case, the aim is to make the board or screen interactive. It is an opportunity to get away from the prepackaged language of the textbook, the power point, and the CD in order to work directly with language points and skills that reflect precisely where your students are on their individual language journey. I am using your “content” and “shadow” word concept via Prezi and other visuals for vocabulary this semester. It is quite interesting to see which students find visualizing content words helpful and how discussion of more shadow-type words ensues.